The Great Pacific Garbage Patch is a vast area of the Pacific Ocean where tons of plastic garbage has been accumulated for years. It is bounded by the North Tropical Pacific Gyre. A Gyre is a circulating flow of ocean current. There are total five Gyres – the North Pacific, South Pacific, North Atlantic, South Atlantic and Indian Ocean Gyre. The circulating water of a gyre creates a water body separated by the rest of the ocean. The plastic debris is dumped into the sea from the industrialized nations which are close to the North Atlantic Gyre. The source of all these litter is the population of the big cities, industries, harbors and ships. The ocean currents and the wind take the debris into the Gyre. The Gyre accumulates these plastic pieces in two areas, one near Japan and another to United States. Over the years the effects of sunlight and sea water breaks the debris items into very small floating particles. These particles are accumulated for decades and have resulted in the Great Pacific Gyre or the Pacific trash vortex. 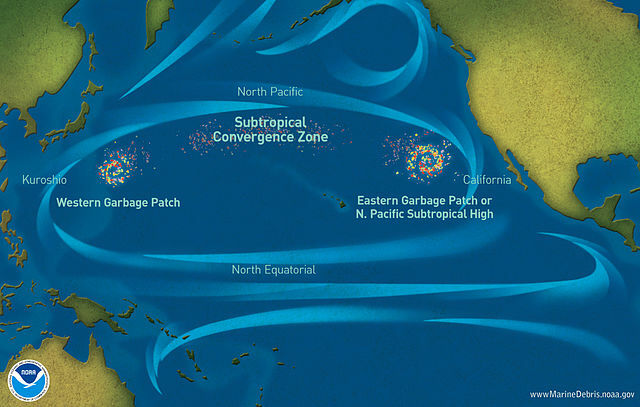 It is very difficult to determine the actual size of the North Pacific Garbage Patch. The floating plastic particles are too small to be seen from a inspection boat. Moreover, a large portion of the debris is not floating near the surface. So, a satellite photo or a surveillance plane is useless in this case. There is only one way to know the answer, sampling the water in many places. There are many opinions about the size of the trash vortex. According to some the extent of its area is 270000 sq mi. Some environment experts give a much larger figure of 580000 sq mi. The area is no doubt large and it is increasing day by day. The plastic is not a biodegradable material. It is only disintegrates by the light. The light of the sun breaks the floating plastic debris into very small particles. These micro particles become so small that it enters the marine food chain. The smaller fishes and sea animals ingests the plastic particles. The bigger fishes, turtles and sea birds eat many such fishes. In this way, considerable amount of plastic is accumulated in their stomachs. Humans are also being affected by eating these fishes, shrimps and crabs. Some plastics can be decomposed by the sea water and the sunlight. 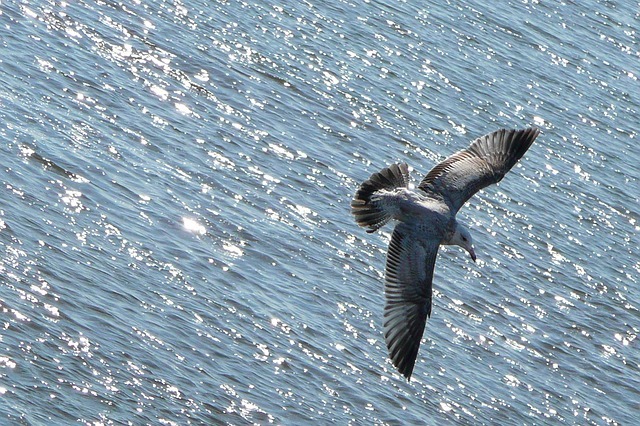 They release toxic chemicals like bisphenol A or PCB in the sea. As a result, many smaller animals die due to water pollution. The plastic is not a safe thing to eat. The floating plastic debris of the Pacific can come to your plate by the way of the food chain. 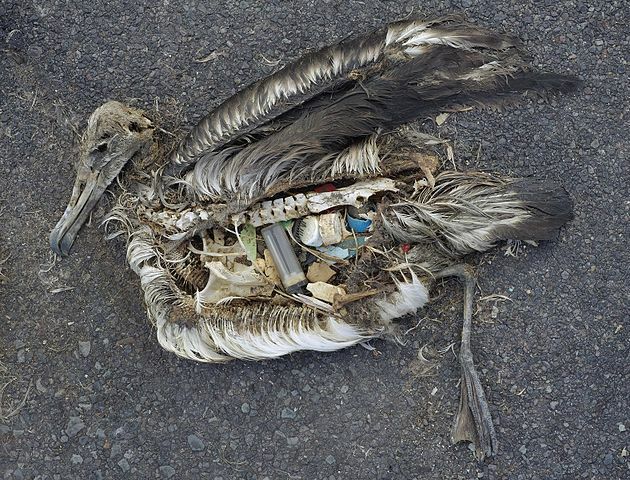 It is observed that about 33% chicks of the Albatross at the Midway Atoll die to the plastic pollution of the Great Pacific Garbage Patch. The toxins cause the death of many smaller species of sea animals. It also helps to spread the growth of invasive species like Jellyfish. These types of animals can absorb pollution better and so they proliferate in this area. It results in farther degradation of the marine ecosystem. It is very difficult to clean the Great Pacific Garbage Patch. The very small floating plastic materials are difficult to filter from the water without harming the smaller animals and plankton. A net will also catch these sea animals with the plastic particles. Even if we filter it with some special process or technology, the area is too big to clean. It would take many decades to accomplish the task. The cost of the operation will also be too high. It is far from the continents and so no country is interested to take the responsibility. But there are many organizations who are trying their best to do something about this problem. There are many experts who are researching about the problem. Many organizations and self help groups are trying their best to create awareness among people about the problem and its future hazards. Clean Our Oceans Refuge Coalition or COORC is an organization which has taken to clean this area with three special vessels which will also convert the debris to energy. They will also conduct research on the area with these ships.